This boy is the best deal in the alpaca industry at the moment. 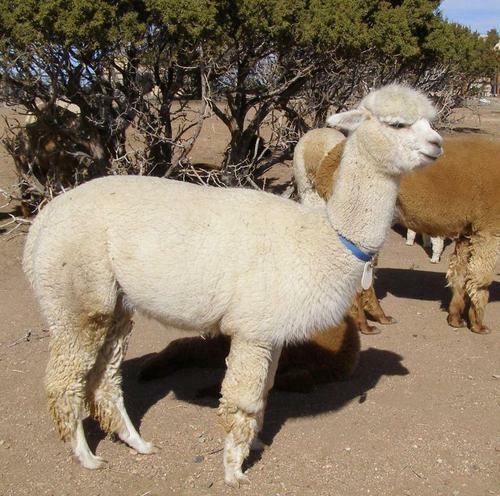 He is a very attractive, strong white male with fantastic conformation and excellent fleece characteristics. He currently has 3 offspring on the ground - ALL FEMALES - and spectacular females to boot, each one better than the last! They all have really nice personalities and superior fleece statistics. Pago is part of a herd that I am fostering since their owner suffered a physical disability. 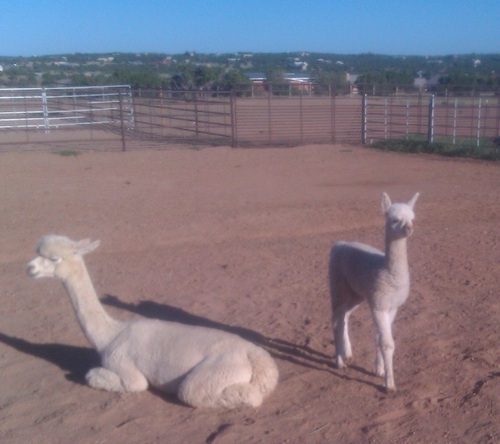 The two alpacas that I took for my herd in trade for supporting and brokering the others are both his daughters! The third female offspring was born to me and I consider her a real treasure. She has the best histogram I've ever seen. I have kept Pago under my hat for the past few months - I wanted to get to know him and I have toyed with incorporating him into my herdsire stable. However, he shares similar genetics with a lot of my females; I have acquired a couple of other white males with completely different genetics from the rest of my stock, so have decided that Pago deserves a home where his considerable attributes can be a benefit. We will be sorry to see him go - he's a cutie - but he's too good to waste. This is a great opportunity to add a great white herdsire to your herd at WAY below value. Soleil gifted us with exquisite Angelique this fall...a beautiful white female Cria with fine dense fleece and very correct conformation and coverage. She is a hale and hearty little thing with personality galore! 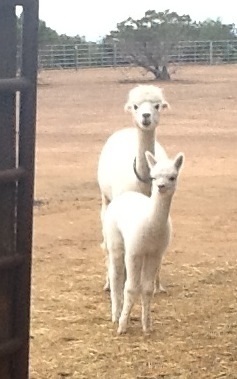 So far Soleil is two for two female offspring and is holding her fleece quality quite nicely. She sells with a breeding to the male of your choice...Several champion boys to choose from. Financing is available to qualiied buyers. We also accept all major credit cards.